What a difference a few hours make, and the red curve was the finished result. Earlier in the morning on the dyno, I was at the green curve stage, come the afternoon I was sitting pretty on the red curve, and when you compare the gains from each improvement, you can see a GTS responds well to modification. 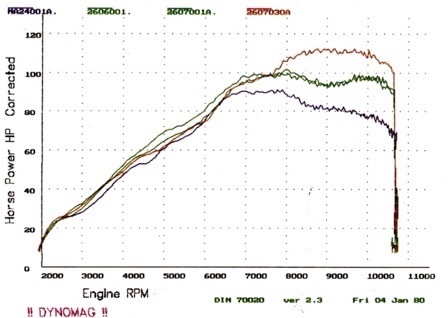 If you look at the standard curve and where I am now, there are virtually no losses, and huge gains, between 22-36 hp more than standard, and no camshafts, engine mods or porting has been done to date. Talk about free horsepower.